A random side note: I haven't really taken the opportunity to write about pizza so far on this blog, mostly because my experience with pizza growing up all the way to a couple of years ago was probably like most of America - a mix of the basic chain pizza offerings (pizza hut, dominos, papa john's), your basic local mom-and-pop pizza joints (I feel like everyone growing up here in the U.S. must have memories of at least one greasy pizza joint that they frequented during high school and/or college), with a sprinkling of more upscale-types of pizza - often cooked in a wood-fired pizza oven, and some deep-dish pizza. All of them were decent, but nothing really ever stood out in my mind (with the exception of Mulberry St. Pizza in Los Angeles, home of the most authentic and delicious NY-style pizza in the Southland - they import their water from N.Y. which is taking things seriously, I must say!). Some ingredients were more fresh, some less so, some pizzas were greasier, some tomato sauces more spicy, some more bland, etc...you get the picture. I never really got excited about pizza - not until I tried my first Neopolitan-style pizza place (at some random place in NY, I don't recall the name). After that, I realized I found my pizza match - my pizza soulmate, if you will ;), and I have been hooked on finding good Neopolitan-style pizza ever since. Of course, I forgot to take an outside photo of Monza Pizza, *sigh*. 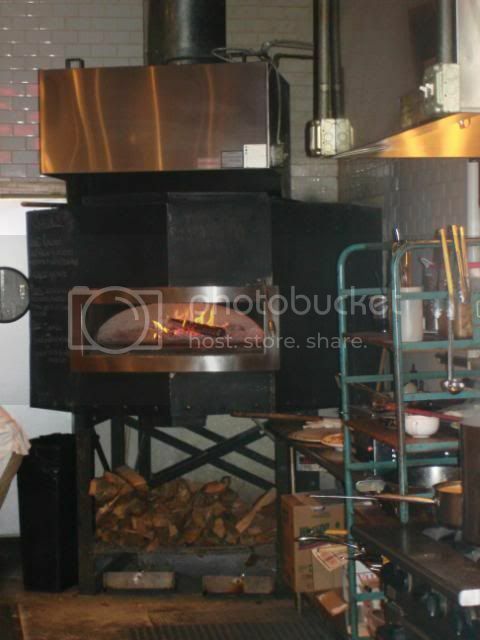 So, although I can't help you find the restaurant (hopefully I can add a photo some other time when I get back to Charleston), I can point out the most important thing in Monza Pizza - their wood-fired oven. Although it isn't essential (Varasano's in Atlanta, the best Neopolitan-style pizza I've had in my life so far - and a place that I will definitely write about soon - uses an electric oven), something about the wood helps a lot, for some reason....I think the wood imparts a slight smokiness that adds an additional dimension to the flavor of the dough. Monza Pizza doesn't just serve pizza...they also serve pastas (I never tried, but then again, the pizza here has been so tasty, why would I want to? 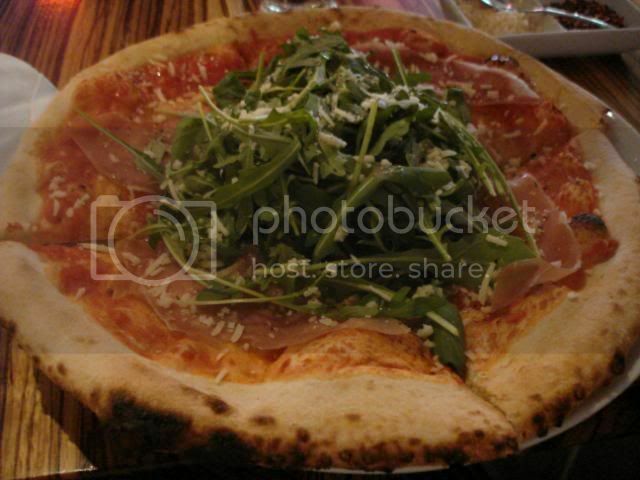 ), as well as decent selection of antipasti and small salads that serve as a nice addition to the main pizza meal. 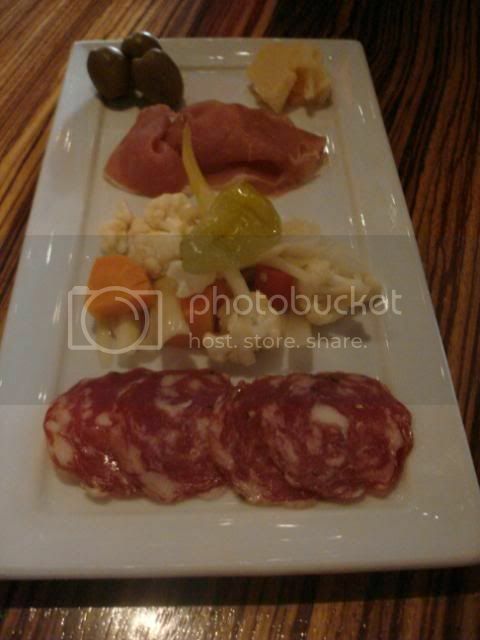 The photo above is of their antipasto plate - a selection of salami, prosciutto, cheese, pickled vegetables, and olives. 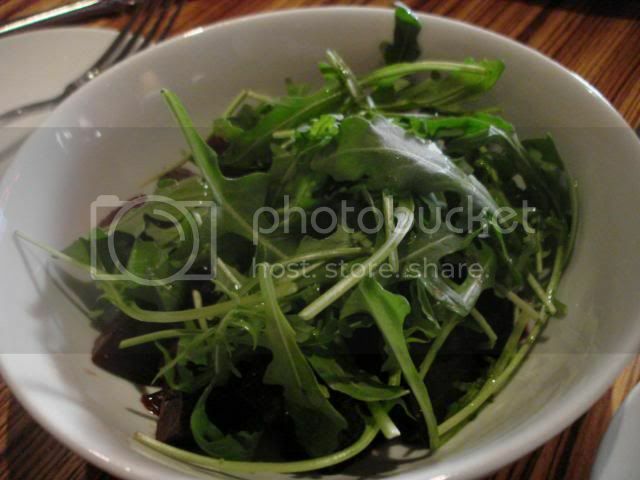 A beet salad - just a simple mix of arugula, beets, some ricotta, and balsamic vinegar. 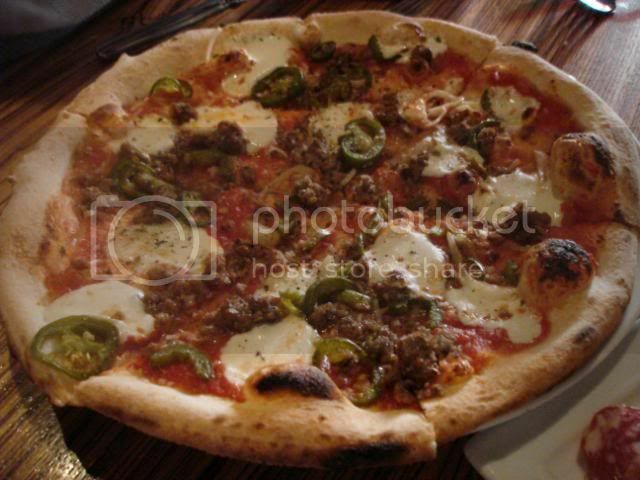 The first photo of some of the great pizzas they have at Monza - this is called the "Fangio" - a pizza for those who like it a little spicy, with tomato sauce, fresh mozzarella, housemade sausage, jalapeños, and onions. A random note - each of the pizzas (and theme of the restaurant itself) has a fun, interesting name centered around Italian motorsports, which I find amusing =). Up next is my favorite pizza at Monza, mostly because I love myself a good slice of prosciutto - the "Volpini", made with tomato sauce, prosciutto, a generous helping of arugula, and dusting of pecorino romano. Lastly, another favorite of mine at Monza - the "Count Louis". 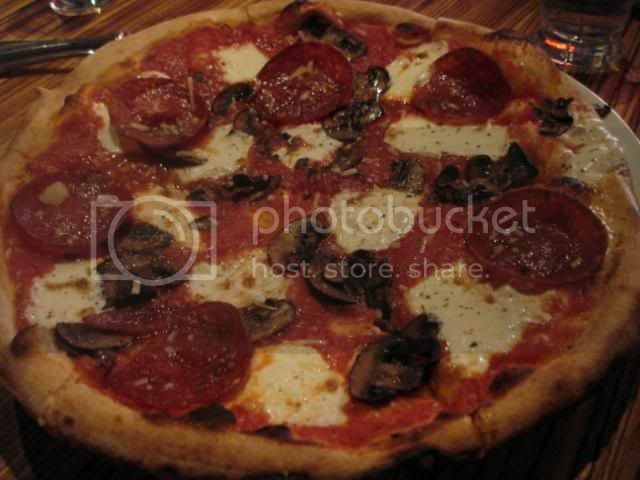 It is made with tomato sauce, fresh mozzarella, mushrooms, and pepperoni, and the fact that I find it delicious with the pepperoni is pretty unusual for me - I usually hate pizzas with pepperoni, because the quality of the pepperoni is usually not the best, which makes the pizza really greasy because the pepperoni releases all that grease when it is baked. But, they use good quality pepperoni here, and so no greasiness, yay! I wish they put more mushrooms on the pizza, but that is the only complaint I have for this one, and that is a nitpicky one, at that. All in all, I definitely enjoy Monza Pizza - while it isn't the best pizza I've ever had (I have a definite Varasano's addiction...), it is definitely the best pizza I've had here in South Carolina so far. Gonna try Monza this week. Thanks for commenting on the blog, I hope you enjoy Monza! Also, thanks very much for the suggestion, I will definitely try EVO pizza when I visit Charleston again!